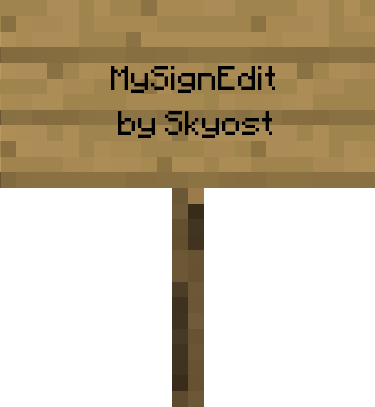 MySignEdit can easily help you edit your signs ! /signedit or /se - Use it like /signedit <line> <text>. Example : /se 3 Line 3 ! You can clear a sign with /se clear. /!\ Warning ! You need the permission : se.edit ! Please go to the Ticket Manager. Those plugins requires Java 7. 1. Maybe in the future. Sorry, it is a mistake from me. Can you add a feature when player use /se to clear the entirely sign? Will this work with 1.6.4? Yes, but it is not from me. Java get spaces in the console (or a player for Bukkit) like nothing. I wish this was the case, but the spaces at the end of "/se 3 coal " do not get captured. do you see what i mean?